Posted July 7, 2016 by Martin Slater & filed under Services. Cresset Discovery Services (CDS) offers bespoke in silico services for small molecule discovery. We do a lot of work in drug discovery and optimization for the pharmaceutical industry but we also work extensively in agrochemicals, flavors, fragrances – in fact, in any industry that involves work with small organic molecules. This post explains the process that we go through when customers work with Cresset Discovery Services, from the first contact to the final deliverables. At the enquiry stage we talk with customers about their requirements in general terms to get an idea of whether we will be able to help them. The answer is usually yes, but we will certainly let you know if we think that our approach would not be the best match for your project. These initial discussions will involve members of both our sales team and the scientific team. Everything at the enquiry stage is free, but the discussions will not be at a great depth since confidential details cannot yet be shared. Once both sides have agreed to proceed, we exchange confidentiality agreements and can then get down to the details. The customer will share their confidential data and CDS will prepare a detailed proposal of the work they will carry out. This stage will involve a detailed meeting to gather the data and another to present the proposal. The proposal will include full details of pricing and milestones. If the work is a collaboration, then all partners will be involved at this stage. Close collaboration is key to any successful project. 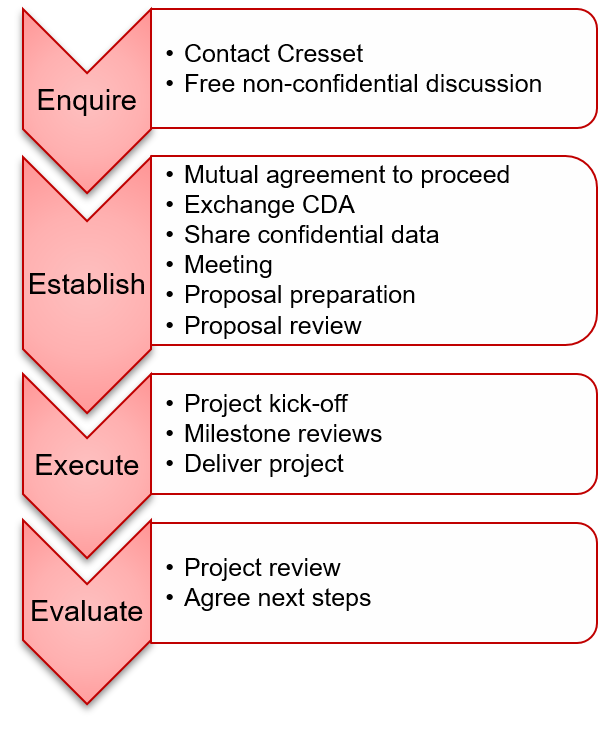 Depending on the size and complexity of the project, there may be several long meetings at the start of the project. These could involve many members of the customer team. The goal is to focus on the project and to scope out exactly what needs to be achieved. Work then moves to the details – for example, what to do, with which molecules and which conformations. This could involve conversations several times a week until everything is in place to run the study. Frequent reviews take place throughput the project between the customer and CDS. Each customer has a personal point of contact who remains consistent throughout the project. At each stage of the project there will be several conversations to make sure that the customer is getting exactly what they wanted. These will be tied in to agreed milestone reviews and deliverables. Project deliverables are likely to be available through the project, not only at the end. No matter when they are delivered, the approach remains the same: we make sure that the customer gets the maximum value out of the results. For example, typical results for a large screening project with multiple compounds may be between 10,000 and 20,000 hits. But CDS will make sure that the customer gets more than a list from the project. We will always ensure that the customer fully understands and can interpret the results in the context of the project in order to get the best out of them. No project is complete without a project review of what went well and what could go better. As part of this process we agree the next steps, which could range from a follow-on project, to advice on the next research steps. Many of our customers remain customers for the long term. In fact, when we do lose a services customer it’s usually because they have decided to buy our software and hire a computational chemist to work full time. This case study describes how we helped one customer to hire and train computational chemists. Even then, customers still come back to us for projects if they need the extra resource. Contact us today to start the process of working with CDS.